For the gem mosaic of the application, in the beginning of the birth of women’s fashion has become an indispensable element. Colorful gemstones, crystal clear diamonds, not only has a decorative style of the decorative style, but also with the bezel, dial the perfect combination of time to show the pragmatism. 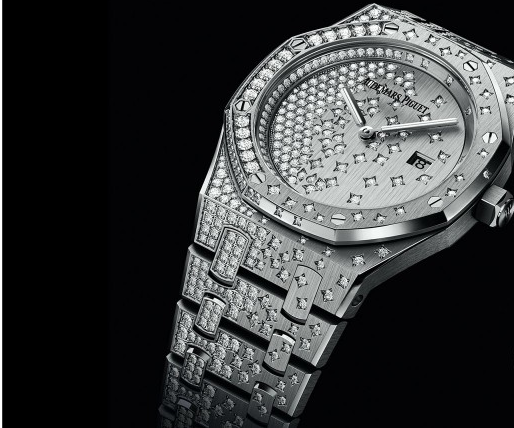 In the development of women’s timepieces, Audemars Piguet will decorate the innovative interpretation: the new Royal Oak Series ladies watch with a unique gem inlaid design, swirling engraved diamond pattern from the dial and bezel spread to the strap above , As if drilling stars, pouring in the wrist. Case and dial to 541 bright cut diamonds to create a charming visual effects, swirling mosaic pattern looks like a random design, in fact, each location has a precise consideration, and the perfect fusion of the Royal Oak Series unique design Style, as abstract painters on the canvas on the fall of the strokes, seemingly random, but unique meaning. Royal Oak Series Women’s watch, case and dial to 541 bright cut diamonds decorated 33 mm diameter of the new Royal Oak Series Women’s watch with 18K rose gold or platinum case, vividly show Audemars Piguet in a unique way Superb craftsmanship, design innovation and elegant temperament of the perfect fusion. The new royal oak series women’s watch is to break the diamonds inlaid immutable routine, in a seemingly random way embellishment in the case, bracelet and dial different location, full of freehand beauty. Royal Oak Series Frosted Gold “frost gold” watch without the use of diamonds inlaid under the premise of only the case and the bracelet to impose a hundred years of history of the hammer gold craft, you can achieve as bright as diamonds decorative effect. Royal Oak Series “Frost Gold” watch compatible with advanced jewelry craft tradition, with the ancient hammer gold craft (also known as the Florentine craft), the perfect application of the unique structure of the Royal Oak Series case and strap, effort to create bright shining platinum With the rose gold material masterpiece. The hammering process uses a tool with a diamond at the top to hit the surface of gold, producing a very subtle notch, showing a diamond-like bright effect. This uncompromising craftsmanship creates a unique texture that makes the watch surface even more bright in the light, as if the stars were moving at night. Hammer gold craft to create the case and strap, with bright shining light highlights the unique and precious addition of a point, without diminishing, but make the legendary masterpiece add fresh modern style. No gems, but like a diamond-like light shine. Eye-catching, unique, precious, belong to the United States if the “cream” of her. The new watch has a engraved “Lady Tapisserie” ladies decorated with silver dial, with silver sub-dial, rose gold material fluorescent three-dimensional standard and the Royal Oak pointer pavilions, making the disk looks more beautiful and elegant. The pointer also has a fluorescent part, so that in a dark environment can also observe the time, intuitive and convenient. Three small function plate with a conspicuous, soft rose golden circle separated, and the whole dial blending, clear and eye-catching. Retains the brand octagonal case design, whether it is bezel or screw, after careful handling of the brand texture, delicate and full of sense of strength. And the bezel on the 32 bright cut diamonds into one, very beautiful. 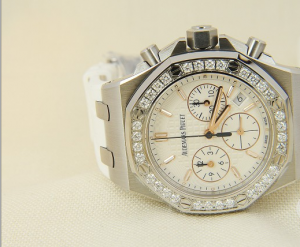 Octagonal screwdriver crown engraved Audemars Piguet brand LOGO. Close the process, so watch more secure and reliable. The back cover engraved with RoyalOak Offshore, as well as the English limited edition words, show the unique watch. Equipped with Audemars Pig Caliber 2385 movement, with 18K gold pendulum Tuo, power reserve for 40 hours. White rubber strap with stainless steel AP words folding clasp. In addition, there are blue rubber strap, free to match. Summary: In addition to the summer limited edition ladies watch, we see there are some new and past classic watches are also sold in the sale, we can see the table is more complete when the table is complete. Like this watch or other brands of the table friends may wish to take advantage of this opportunity to choose a choice in the store, take a look.